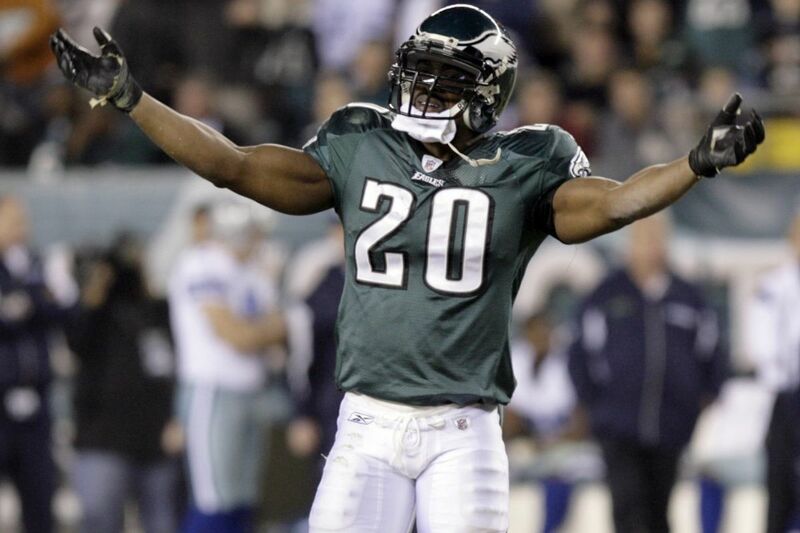 Eagles’ great Brian Dawkins raises his arms in the third quarter against the Dallas Cowboys on Sunday, December 28, 2008. For the second straight year, former Eagle Brian Dawkins is one of the 15 modern-era finalists for the Pro Football Hall of Fame. The names of the 15 finalists for the class of 2018 were announced Tuesday. Dawkins' former Eagles teammate, Terrell Owens, is a finalist for the third straight year. The Hall's 48 selectors, composed of writers, broadcasters and ex-players, will meet in Minnesota on Feb. 3, the day before the Super Bowl, to pick this year's class. No more than five modern-era candidates can be selected to the Hall of Fame in a single year. Two senior finalists – former Houston Oilers linebacker Robert Brazile and former Green Bay Packers guard Jerry Kramer – were announced several months ago, along with one contributor finalist – former Washington Redskins general manager Bobby Beathard. They are voted on separately and have no bearing on the number of modern-era candidates who can go in. Dawkins and Owens played together on the Eagles' 2004 Super Bowl team, which lost to the New England Patriots. Among the other 13 finalists are four players who are in their first year of eligibility: linebackers Ray Lewis and Brian Urlacher, guard Steve Hutchinson and wide receiver Randy Moss. Former Dallas Cowboys cornerback Everson Walls is a first-time finalist in his 20th year of eligibility. The rest of the final 15 all have been finalists before: offensive linemen Alan Faneca (3rd year), Joe Jacoby (3rd), Tony Boselli (2nd) and Kevin Mawae (2nd); wide receiver Isaac Bruce (2nd); running back Edgerrin James (2nd); cornerback Ty Law (2nd); and safety John Lynch (5th). Dawkins, a nine-time Pro Bowler and four-time first-team All-Pro, redefined the safety position in the NFL. He was part safety, part cornerback, part linebacker. The late Jim Johnson, who was the Eagles' defensive coordinator for most of Dawkins' career in Philadelphia, built his successful defense around him. He is the only defensive back in league history to record 25-plus career sacks (26), interceptions (37) and forced fumbles (36). Dawkins, who was the Eagles' second-round pick out of Clemson in the 1996 draft, currently works for the team as a football operations executive. He played 13 years for the Eagles, then finished his career with the Denver Broncos, playing three seasons for them before retiring after the 2011 season. Eagles Brian Dawkins gets fired-up before the start of their first game of the season on Sunday, September 12, 2004 at Lincoln Financial Field. Owens played 15 years in the league with five teams, including the Eagles. He also was selected in the 1996 draft, taken in the third round by the San Francisco 49ers out of Tennessee-Chattanooga. He spent his first eight seasons with the 49ers, then two with the Eagles in 2004-05, three with Dallas and one each with Buffalo and Cincinnati. His 15,934 career receiving yards are the second most in league history. Only Jerry Rice (22,895) has more. Owens is fifth all-time in touchdown catches (153) and eighth in career receptions (1,078). His pass-catching numbers should make him a Canton no-brainer. But his negative impact on the locker rooms he inhabited during his career, particularly the Eagles' in '05, have hurt him with many selectors. While he basically tore apart the '05 Eagles with his selfish behavior over the team's refusal to give him a contract extension, he played a major role in helping them make it to the Super Bowl the year before. He caught 77 passes for 1,200 yards and 14 touchdowns in 14 games that season before suffering severe injuries to his right ankle and leg that were thought to be season-ending. But he had surgery to repair the damage, which included the insertion of screws in his ankle joint, rehabbed and somehow managed to make it back in seven weeks to play in Super Bowl XXXIX. He not only played in the game but had nine receptions for 122 yards in the 24-21 loss.